Are you part of a family? Do you ever dance together in your kitchen when you hear good music on the radio? Please join in this fun workshop for all ages. With the guidance of teacher Michel Hardbarger, you will learn simple dances and move together as a community. Changs International Folk Dancers is the longest continuously operating folkdance club in the United States. 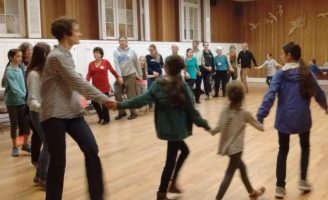 The third Friday of the month, a Family Folk Dance Night is hosted, and they would like to share this experience with the families attending the 2019 San Francisco Free Folk Festival. Michel Hardbarger, the family night teacher, is a longtime dance and music teacher. Michel’s specialty is engaging a group to become a community moving together with music. Orff-Schulwerk certified and recognized by the Bay Area Circle Dancers with a First Place Award for her choreography, Michel spends much time in schools and community centers in the Bay Area sharing movement and music.